It was the dry stone wall that first caught my eye. A wobbly wall. 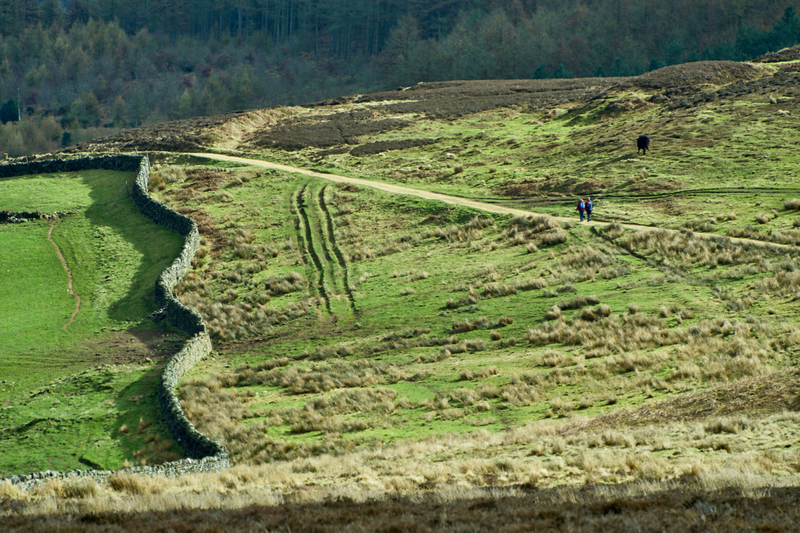 The two walkers are using the well constructed Cleveland Way to cross Scarth Wood Moor, a National Trust property given in 1937 by Major Herbert Peake and his son Capt. Osbert Peake, later to become the 1st Viscount Ingleby of Snilesworth. To the left of the wall are pasture fields known collectively as Sheaths. A cottage with the same name once stood on the field side near the gap in the wall. There was an adjacent limekiln too which was the subject of an archaeological excavation in 1977. Frustratingly this report has not been published. Interesting link Mick. The limekiln takes me back to the mid 70s. J.K. Harrison was a teacher at our college and one of the leading lights in the Cleveland Industrial Archaeology Society. He had a theory that a number of the limekilns on the moors, particularly those in the north were actually bracken burning kilns (used to produce potash). This was one of the kilns he identified, the other that sticks in my mind is in Garfit Gap (the Cleveland Way passes virtually over the top of it). I presume the excavation was an effort to prove the theory. Just noticed that the Garfit Gap kiln is also on the list as excavated in 1973.